Miyake opened on Fore St. in July of 2011 and has been the recipient of rave reviews from causal diners and critics alike, even earning a James Beard Award nomination within the past few days. They feature many locally raised items and have a farm where they raise some of their own food according to their website. When we arrived with friends, it was during some heavy snow on a week night, but there were still a few tables seated with customers. A waitress led us to our seats us right away. We shook off the snow and soaked in the atmosphere, taking note that the far end of the chopsticks on our table were set upon a stone that looked perfect for skipping in the ocean. Gathering menus, I determined that Miyake had a standard sushi list and also a two-sided menu with one side a beverage menu and the other somewhat of a tasting menu. The tasting side had soup and salads also. There were options to order a chef’s choice, a four item tasting, or to just order everything à la carte. The chef’s choice was also available as a vegetarian option at a lower cost. I was planning on ordering à la carte as I wasn’t prepared for a full smorgasbord of food. I began to look carefully at the menus and immediately scanned for individual items which met my two sushi rules – no raw fish and no avocado. Of course, these requirements make 98% of sushi something I won’t eat, but all the good Japanese restaurants seem to have at least a couple items that fit my criteria, and when they do, I tend to absolutely love the results. Upon inspection, the menu revealed plenty of cooked items and at least a few which I thought would be outstanding. However, some of the ones that were noted as being raw seemed as though they would be fully cooked. Upon asking, we learned that they were topped with a bit of roe but that we could order without that. I was relieved and ready to dive in and make some decisions. Before I had a chance to choose some food, our table ordered a selection of beer and wine. I passed up the opportunity for some sake since it was a school night, but the offering of some rice wine was tempting. With drinks ordered, I started to narrow down the food in my head. I definitely wanted a salad, so I decided on the House Salad which came with a miso something-or-other dressing. Then I considered all manner of dishes with crab, lobster, and scallops, but there were a few. After deciding it would be either the Crab Cake or the Lobster Roll, I went with the latter – lobster meat broiled with spicy mayonnaise in a black sesame soy paper wrap with tobiko and truffle oil. I did order without the tobiko which apparently is a sneaky word for the roe. I hadn’t had lobster in a while, but my body was ready for some – just not with raw fish eggs. Soon, my salad came out with a variety of other soups and salads. Mine with rife with leafy greens and lightly tossed in the dressing. It was quite delicious for a basic salad. The dressing was akin to a light vinaigrette but had plenty of flavor. I nibbled like a rabbit and couldn’t help but notice the seaweed salad across from me. Next time, I’ll try that for sure. Everyone seemed to be pleased with their food to that point. My wife’s miso soup was sufficiently status quo according to her. We all finished our apps and waited for the main event. It arrived without much delay and mine looked interesting. 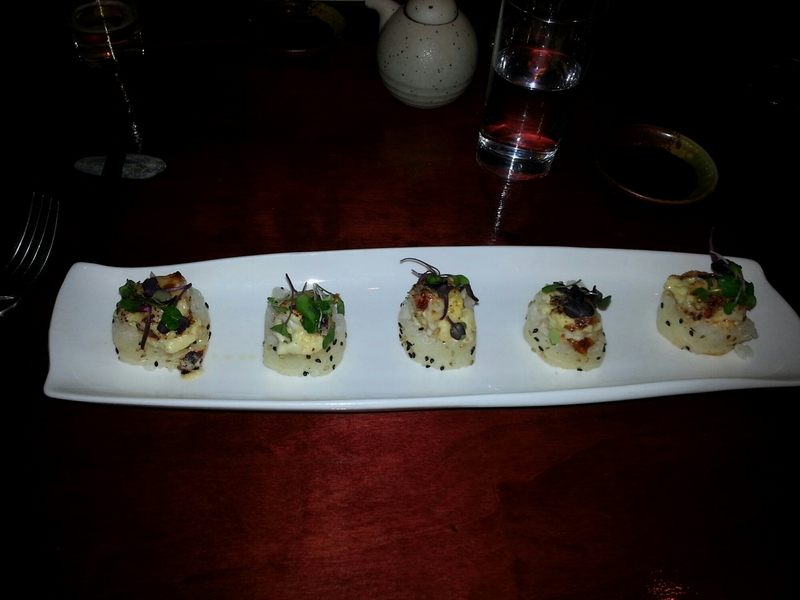 Consisting of five rolls on a long plate, the rice was topped with the lobster and mayo. Unfortunately, it didn’t come with the typical pickled ginger and wasabi, but I did pour some soy sauce into my little soy sauce bowl. The other food around the table consisted of a combination of both raw and cooked items, but I was too focused on mine to care about anyone else. I sliced my first lobster roll in half and consumed it. Perfection! The combination of flavors was astounding. The spicy mayo was delicious and jived really well with the sweet lobster and rice base. I took the other half and dipped it in soy. Again, it was super. I alternated between soy and non-soy bites stopping in between only to allow for breathing. As I continued to eat, I couldn’t help but wonder why it had been so long since I had last had sushi, but I knew I couldn’t wait that long again. Miyaki’s take on lobster was great and I’ve reason to believe everything else would be delicious too. I was fortunate that my significant other had a couple lobster rolls left that she wasn’t eating, so I scraped some roe off and popped those things in my craw. It was a bonus I didn’t expect like hitting the jump button on your Nintendo controller by mistake and triggering a coin dispenser in Super Mario Brothers. When I finished, I was thoroughly impressed and understood why they were nominated for a James Beard Award. Miyake has great food, but know that they aren’t cheap. My salad was $7 and the lobster rolls ran $25 for the plate of five. It’s hard to complain though, because they were incredible. I’ll definitely go back to try some other food there and will most certainly partake in some sake for the full experience. If you haven’t been to Miyake yet, I highly recommend it. They have great food, a fantastic atmosphere, and create a really enjoyable experience. This entry was posted in Portland, ME food on February 26, 2015 by peterpeterportlandeater.